Depending on the current availabilty, select bowling lanes will be available for purchase on the night of the event. Please enter event at 44th Street and 8th Ave (South) between 7:00PM-11:30PM and 12:15AM-2:00AM (as regulated by NYPD.) Admittance restrictions may be in place during the Ball Drop (11:30PM - 12:15AM.) Regardless of admittance time to your party, make sure to enter the Times Square area no later than 8pm. Your Seated VIP Ticket gains you access to Times Square on Dec 31st. Please make sure to have your ticket with you upon arrival in Times Square. You will need to show it to any security if needed. Please enter event at 44th St and 8th Ave (South) between 7:00PM-11:30PM and 12:15AM-2:00AM (as regulated by NYPD.) Admittance restrictions may be in place during the ball drop (11:30PM - 12:15AM.) Regardless of admittance time to your party, make sure to enter the Times Square area no later than 8pm. Your Ultra VIP Ticket gains you access to Times Square on Dec 31st. Please make sure to have your ticket with you upon arrival in Times Square. You will need to show it to any security if needed. Your Platinum VIP Ticket gains you access to Times Square on Dec 31st. Please make sure to have your ticket with you upon arrival in Times Square. You will need to show it to any security if needed. Please enter event at 44st St and 8th Ave (South) between 7:00PM-11:30PM and 12:15AM-2:00AM (as regulated by NYPD.) Admittance restrictions may be in place during the ball drop (11:30PM - 12:15AM.) Regardless of admittance time to your party, make sure to enter the Times Square area no later than 8pm. Your VIP Bowling Package Ticket gains you access to Times Square on Dec 31st. Please make sure to have your ticket with you upon arrival in Times Square. You will need to show it to any security if needed. Please enter event at 44st Street and 8th Ave (South) between 7:00PM-11:30PM and 12:15AM-2:00AM (as regulated by NYPD.) Admittance restrictions may be in place during the ball drop (11:30PM - 12:15AM.) Regardless of admittance time to your party, make sure to enter the Times Square area no later than 8pm. Going outside to smoke is not guaranteed and will be determined by NYPD the night of the event. Each guest at a Bowling Package VIP with Bottle service table must be 21 years of age. Your VIP Bowling and Bottle Service Package Ticket gains you access to Times Square on Dec 31st. Please make sure to have your ticket with you when coming to the event. You will need to show it to any security if needed. Access in and around Times Square controlled by NYPD. Please enter events between 9:00PM-11:30PM and 12:15AM-2:00AM (as regulated by NYPD.) Admittance restrictions may be in place during the ball drop (11:30PM - 12:15AM.) Regardless of admittance time to your party, make sure to enter the Times Square area no later than 8:30pm. *Gratuity is NOT included in the ticket price and is an additional charge paid on the night of the event. VIP priority admission by separate VIP line. Complimentary midnight champagne / prosecco toast. Your Central Park Lounge All Access Pass gains you access to Times Square on Dec 31st. Please make sure to have your ticket with you upon arrival in Times Square. You will need to show it to any security if needed. Enjoy reserved seating in Central Park Lounge VIP room (GA ticket holders stand). Each Central Park Lounge Seated VIP ticket holders shall have a reserved seat for the duration of the event. Only persons holding Central Park Lounge Seated VIP tickets may use reserved seating. Central Park Lounge Seated VIP tickets accommodate any size group (no minimums required – pending availability). Bottle service or cocktail service for Central Park Lounge Seated VIP ticketholders is not included. Your Central Park Lounge Seated VIP Ticket gains you access to Times Square on Dec 31st. Please make sure to have your ticket with you upon arrival in Times Square. You will need to show it to any security if needed. Each guest at a Central Park Lounge Ultra VIP table must be a Central Park Lounge Ultra VIP ticket holder (ticket price is per person). Your Central Park Lounge Ultra VIP Ticket gains you access to Times Square on Dec 31st. Please make sure to have your ticket with you upon arrival in Times Square. You will need to show it to any security if needed. Each guest at a Central Park Lounge Platinum VIP table must be a Central Park Lounge Platinum VIP ticket holder (ticket price is per person). Your Central Park Lounge Platinum VIP Ticket gains you access to Times Square on Dec 31st. Please make sure to have your ticket with you upon arrival in Times Square. You will need to show it to any security if needed. Amp up this New Year's Eve at Bowlmor's mega-watt entertainment complex with an impressive, state of the art bowling arena located in New York City's Times Square. Bowlmor sets the precedent for the ultimate fun-filled New Year's Eve ideal for family and friends of all ages situated within walking distance from the notorious NYE Ball Drop. Get lost in the expansive venue's diverse and deluxe amenities and games that'll throw your NYE into full-throttle party mode. Head over to NYE party central in Times Square for nonstop energy at Bowlmor's whopping New Year's celebration appealing to party-goers of every age. You'll be overflowing with an endless array of drinks during an eventful 5 hour premium open bar, which will include an abundance of unlimited non-alcoholic beverages for youngsters under 21. Enjoy delicious bites during a complimentary early evening mini buffet of appetizers and entrees. Get down to the sounds of DJ Ollie, one of NYC's top family-friendly DJs and a guaranteed crowd-pleaser. Watch a live broadcast of the Times Square Ball Drop on hi-def screens that'll deliver the electrifying spirit of Times Square without the clamor of the crowd just minutes away. At midnight, revel in a complimentary champagne toast (for ages 21 and over) along with a breathtaking live countdown that will heighten the New Year with pizzazz. For an unsurpassable NYE celebration in luxury, add some opulence to your bowling extravaganza by exploring one of many VIP packages that feature table and bottle service, private lanes, unlimited bowling and more. Embrace the New Year at Times Square's Bowlmor for a phenomenal evening of carousing and mingling with family and friends at NYC's leading entertainment complex. Bowlmor flaunts a modern, multi-leveled space with lustrous lanes and lounge areas with a polished interior setting the scene for the quintessential NYE jubilee. Shimmy your way to the dance floor with the likings of DJ Ollie, and revel in the amenities of traditional arcade games, such as foosball and air hockey. Bowlmor includes an exclusive package to specifically accommodate large groups for a surefire way to jumpstart your New Year's festivities. Don't miss out on the NYE excitement at one of Times Square's high flying mega complexes for an infinite night of ringing in the New Year at high speed. 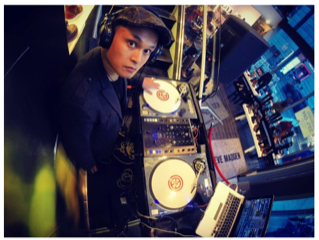 DJ/Turntablist, Ollie has been rocking all kinds of parties from house parties to weddings. Ollie has been spinning for over 17 years where his style was bred from battling, party rocking and overall crowd reading. His experience with different crowds has shaped his DJing style to be well-rounded and diverse to rock any event. Ollie's proficient style in mixing/scratching combined with different genres such as Hiphop, Old School, Reggae, Top 40, Rock, Funk, House, Latin, World Music and more has made him an all around crowd pleaser and one of the most sought after DJs in demand today.